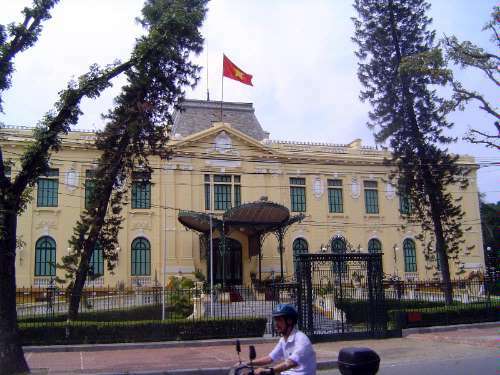 The French ruled Vietnam from the 1880s to the 1950s, which gives them just about the proverbial lifespan of three score and ten. Amazing, then, how deep their impact was. 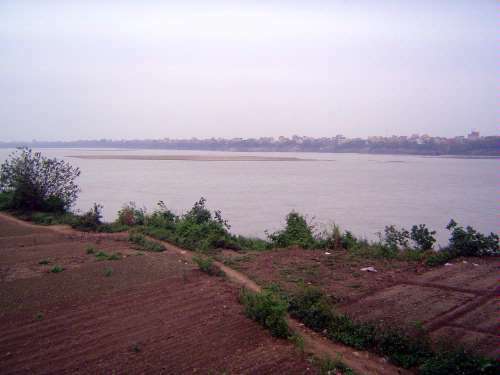 There had been a city here on the banks of the Red River or Song Hong for a long time. 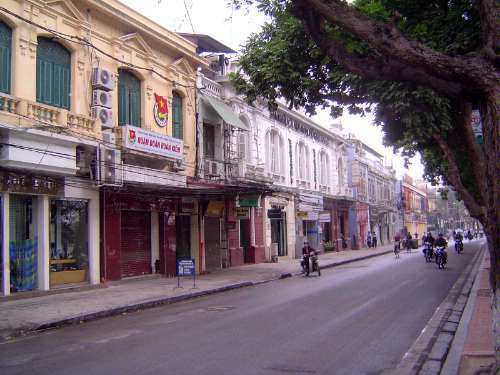 It was called Thang Long until the mid-19th Century reign of the emperor Minh Mang, who changed it, not very imaginatively, to Ha Noi, meaning the city "within the bend of the river". 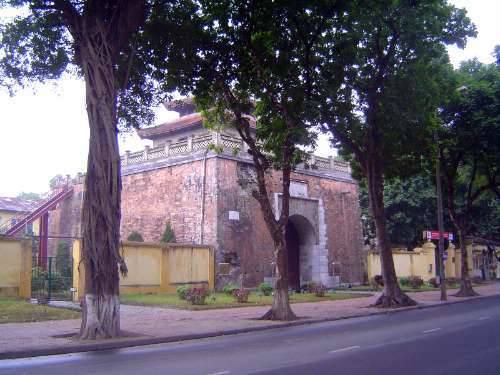 The French conquest included an attack on the Hanoi Citadel, most of whose walls were eventually demolished by the French. 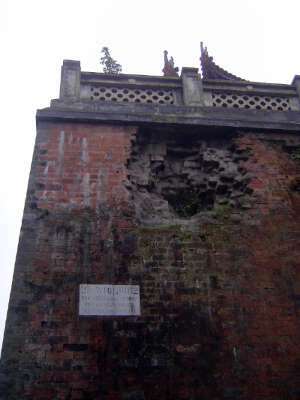 This north-side gate remains. Henri Rivière launched the attack. 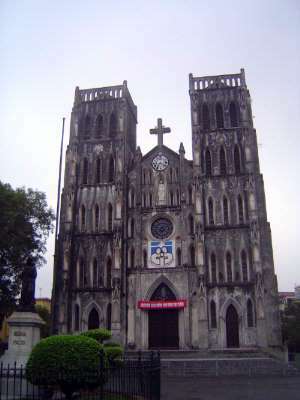 The citadel was then returned to the Vietnamese for a time, and Rivière was killed in another attack the following year. 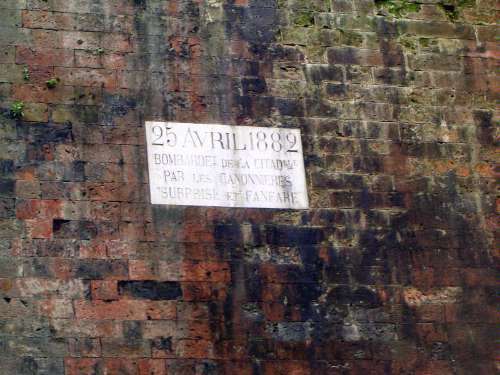 Still, the Patenôtre (Protectorate) Treaty was signed in 1884. 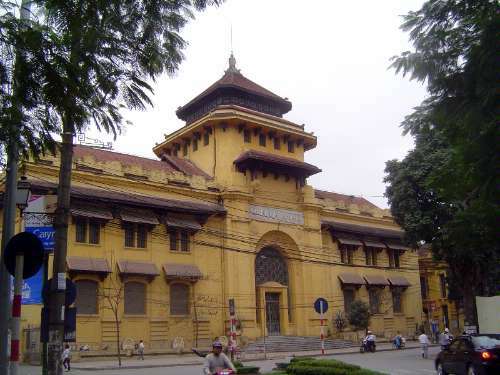 A decade later the French destroyed most of the citadel but left a few bits, like this one, at the urging of the Ecole française d’Extrême-Orient (EFEO), which was even then urging the preservation of what the French today might call Vietnam's "cultural patrimony." 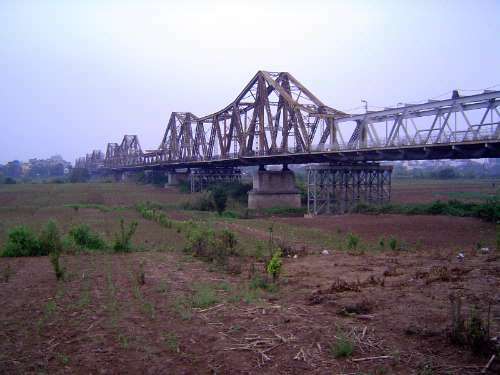 Here's the bridge from an island in the river. 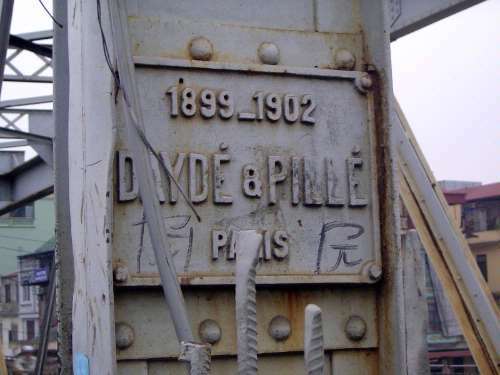 The original piers were masonry, and some of the steel work had to be replaced after repeated American bombings. 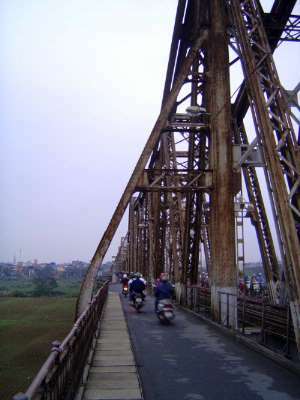 Still, the bridge has proven remarkably sturdy. Perhaps it's the kind of project that Paul Bert, the French governor-general in 1885, had in mind when he defended French rule. "Our peoples are not made to fight each other," he said, "but to work together and each provides what the other is lacking. If the French have come to settle in your territory, you should understand that it is not at all with the thought of taking your lands or your harvests from you; on the contrary, the intention is to increase the general wealth by raising the value of your lands, by facilitating your agricultural production.... The French have the means for doing this, which the Annamites do not yet possess--the capital, the machinery, the engineers and a long experience in business; the French will be your elder brothers." What Bert did not say, of course, was that the Vietnamese did not have the option of saying "no thanks." 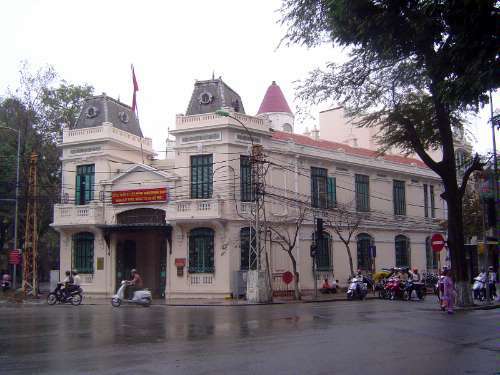 Nor did he add that the French paid for their public works in Vietnam with revenue raised from tobacco, alcohol, and opium. 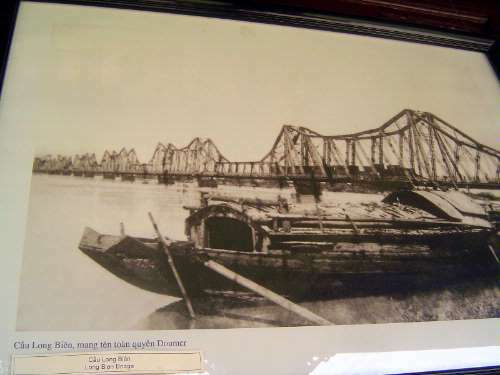 The bridge as it appeared long ago. 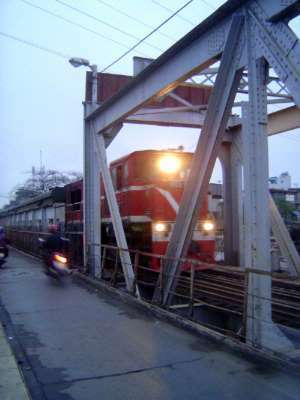 A new bridge just downstream now handles cars and bigger vehicles, but the old bridge remains busy with two-wheelers and trains. There's room for pedestrians, too. 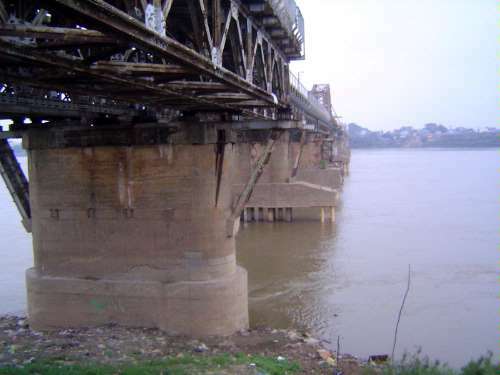 The bridge was bombed in 1967, repaired, bombed again, and repaired again. The builders didn't spend much energy adapting their customary imagery to the local population. 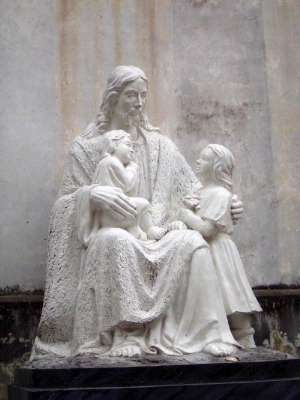 Even though their rule was brief, the French had time for their works of monumental architecture to shift from Beaux-Art classicism first to a blended, semi-indigenous style and then toward modernism. 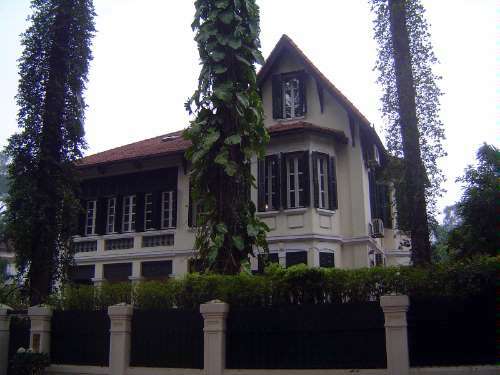 We can trace this evolution beginning here, with the residence of the Resident Superior of Tonkin, built in 1911. 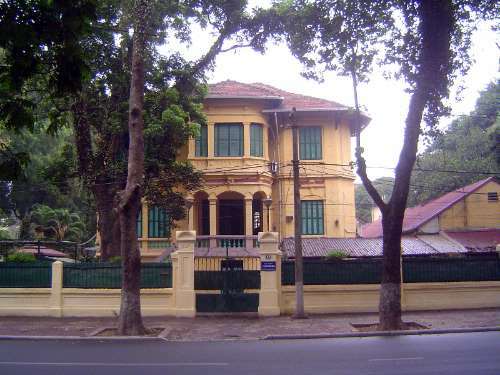 The style reflects the taste of Anguste-Henri Vildieu, who headed the Service des Bâtiments Civils de l'Indochine from 1897 to 1906. 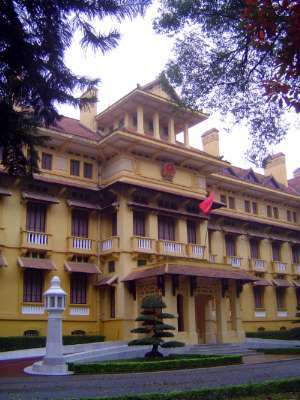 The building survives today as the government guest house. 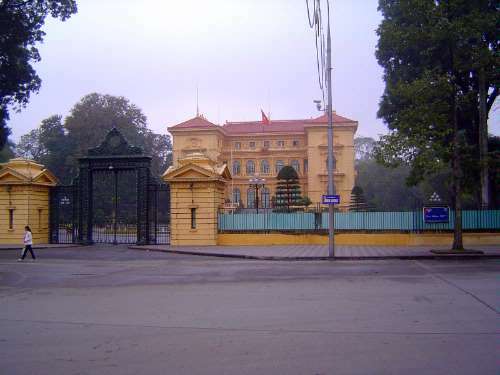 Another bit of classicism: the palace of the governor of French Indochina, now Vietnam's Presidential Palace. This was another product from Vildieu's Public Buildings Service, though the actual architect appears to have been Charles Lichtenfelder. 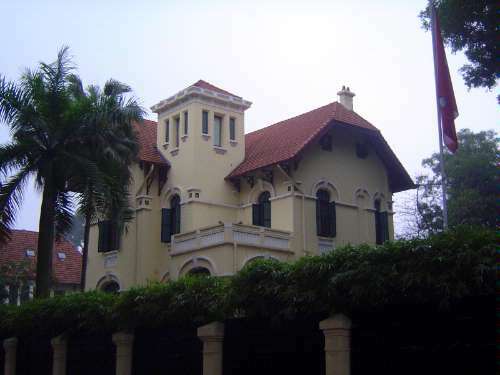 As designed in 1895, the structure was much grander than the building as executed in 1907. Hence the truncated appearance. 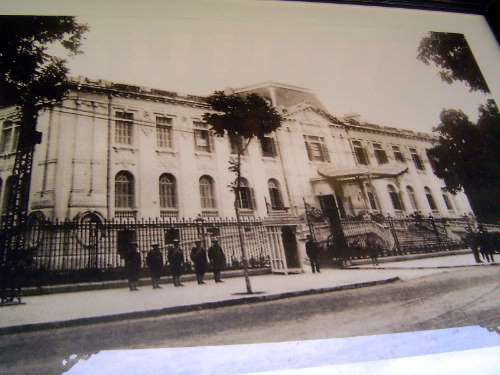 More from Vildieu's shop: the Palace of Justice or Supreme Court, 1907. 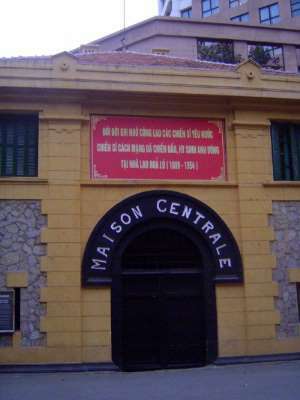 The remaining wing of Vildieu's central prison, the infamous Hoa Lo Prison of 1899. 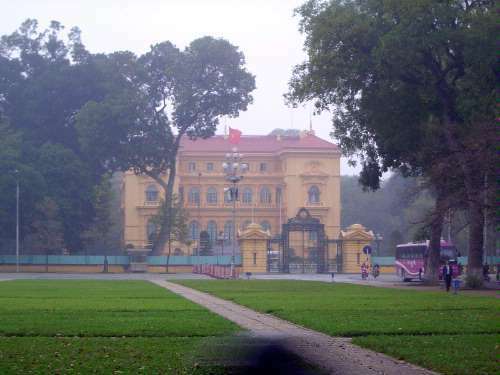 Ironically, the architect of Hanoi's grandest classical pile remains unknown. 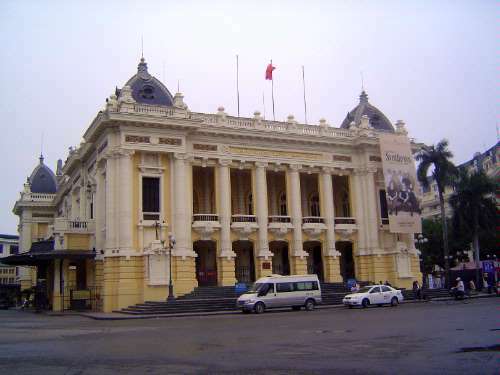 Built as the Municipal Theater, it is commonly called the Opera. Opened in 1911, operatic productions continued into the waning days of French rule. 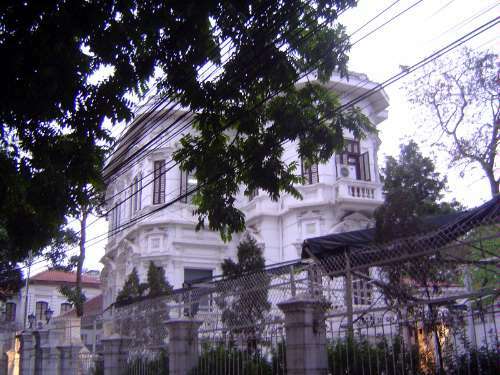 The French came back in the 1990s to spend $20 million restoring the building and perhaps some French prestige. 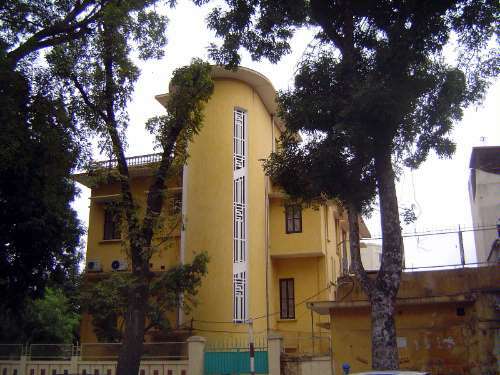 Drifting away from classicism but unsure where it's going, the Lycée Albert Sarraut was built in 1919 by Adolphe Bussy and named for the departing Governor General of French Indochina and later prime minister of France. Its list of alumni reads like a who's who. 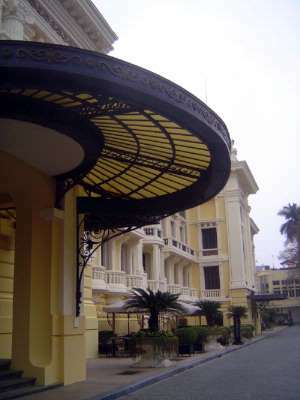 Enter le style indochine. 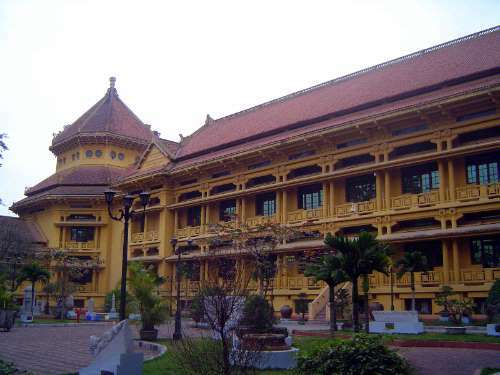 The effort to accommodate local culture in colonial architecture was instigated by Ernest Hébrard, head of the Indochina Architecture and Town Planning Service from 1923 to 1931. Previously Hébrard had done the master plan for Thessalonika, destroyed by fire of 1917. 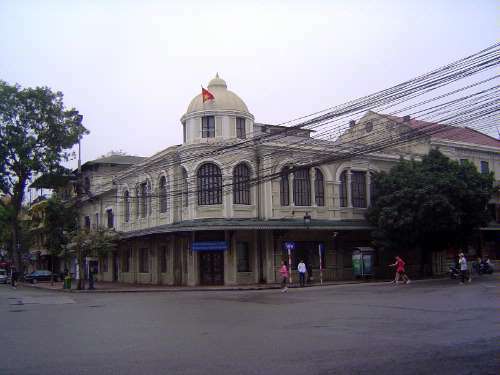 Now, in 1924, he did a master plan for Hanoi. 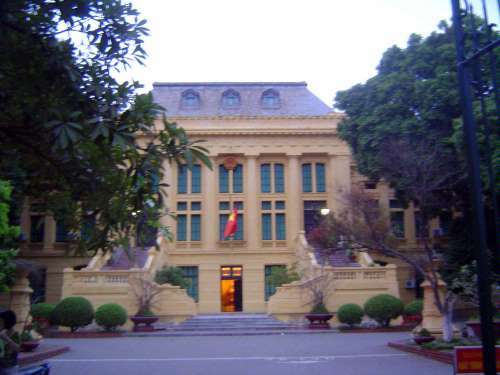 Here, from 1926, is his Indochina University, now Hanoi University. 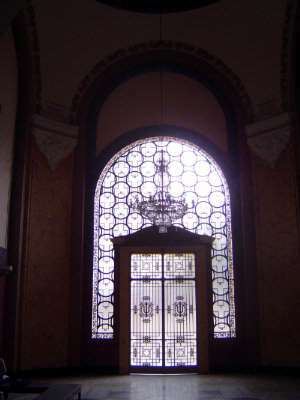 The interior is more purely European. 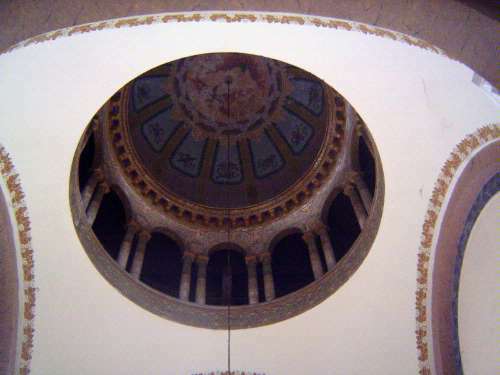 Note the wrought iron logo, with the letter I superimposed on a U.
Dome of the entrance hall. 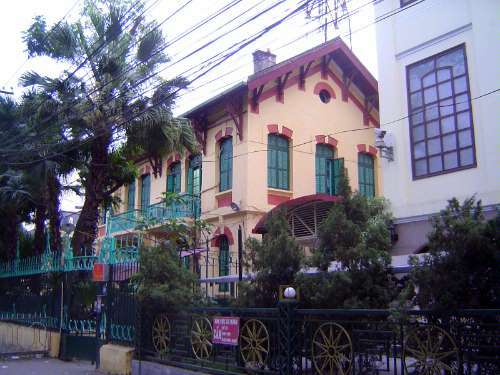 Hébrard's Louis Finot Museum was built in 1925-32 and named for the first head of the Ecole française d’Extrême-Orient; the building is now called simply the History Museum. 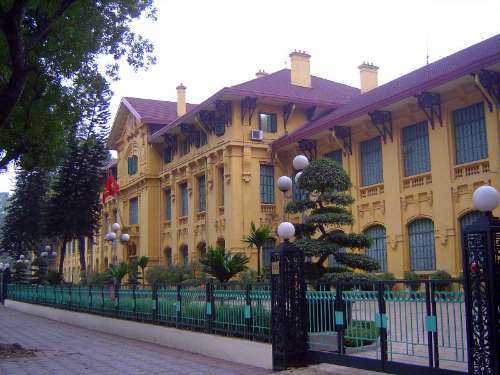 Yet another Hébrard: the less orientalized Ministry of Finance from 1928, now the Ministry of Foreign Affairs. 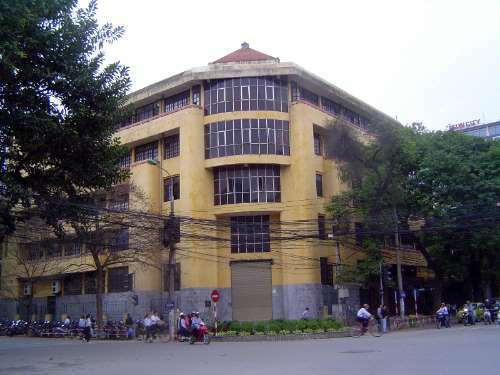 Modern architecture arrived in Vietnam much earlier than it did in Shanghai. 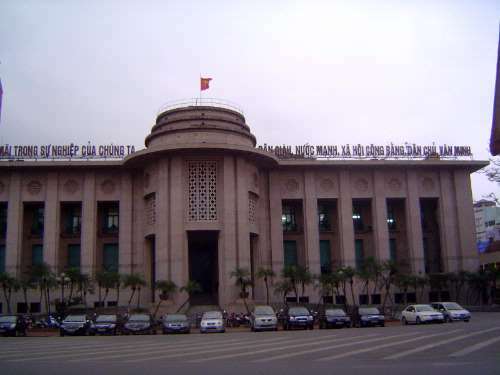 Here, the Bank of Indochina from 1930, designed by Georges Andre Trouvé and now the State Bank. Residential architecture would shift from traditional to modern, too. 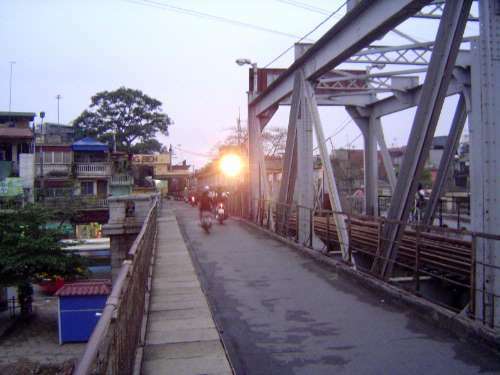 A surprising number of examples remain, mostly in the districts near the presidential palace or to the south near Bay Mau Lake. Many of these houses look as if they were put on blocks and shipped from Europe. Many of the choicer survivors have been snapped up by diplomatic missions, in this case India's. 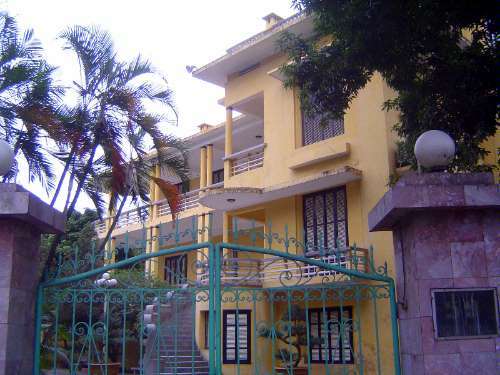 A more modest home, now the office of the Joint POW/MIA Accounting Command (JPAC). 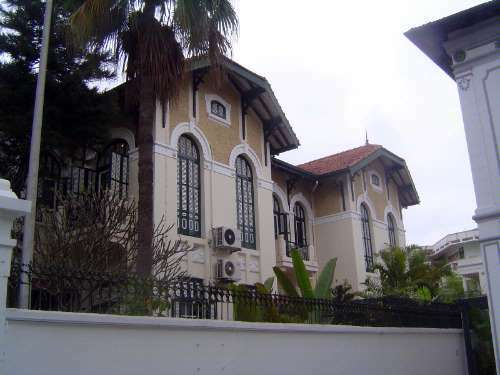 The neighborhood, called Bay Mau, from the nearby lake, developed in the 1920s and 30s as a result of the Hebrard plan and constitutes a gallery of contemporary architecture. 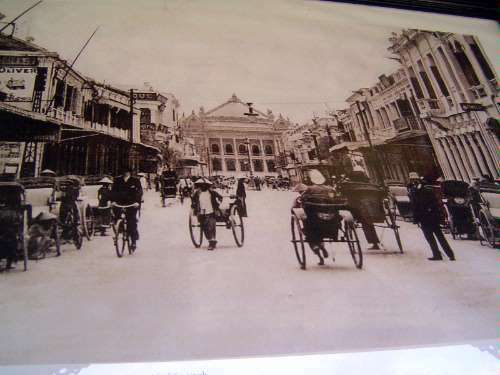 The main commercial street developed by the French terminated at the Opera House. It was called Paul Bert Avenue. 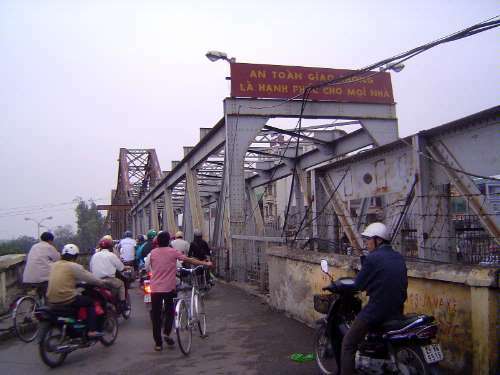 Now it's Trang Tien. 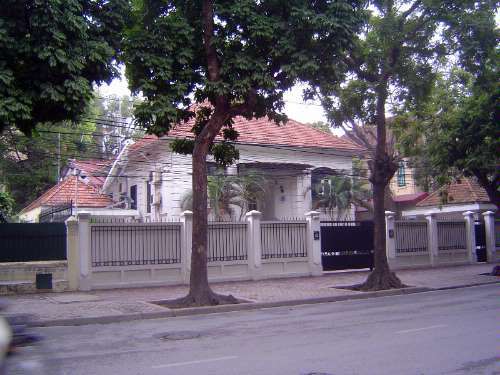 Henri Philippe Marie, Prince d'Orleans, summarized French city building in Vietnam this way: "When we Frenchmen colonise...there are certain good qualities that we carry with us where we go... In the first place, we have a knack of cleaning up a native town, and of constructing next to it something both clean and elegant...."
Some of the buildings of the era have been kept almost unchanged. The Godard department store or Magasins Godard, later yjr Grands Magasins Réunis). Squint a bit, and you can imagine the street as it was. 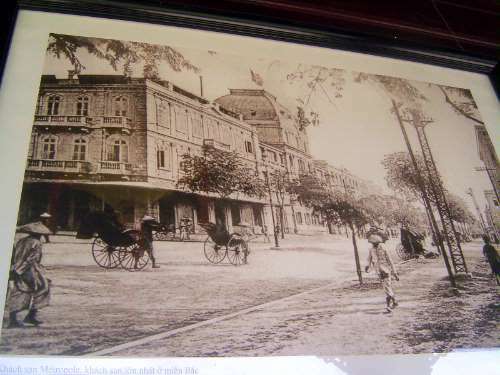 The Metropole Hotel as it was after completion in 1901. 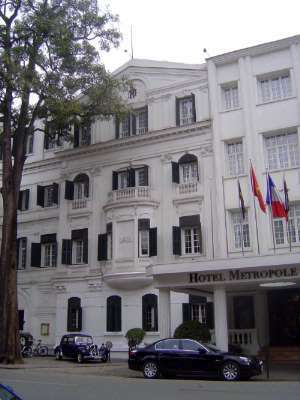 The Metropole became the Thon Nhat Hotel but was then restored (and none too elegantly expanded) by a partnership between Hanoitourism and Accor. 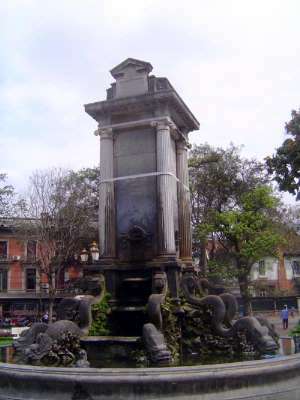 In the park in front of the hotel, the Chavassieux Fountain of 1901.